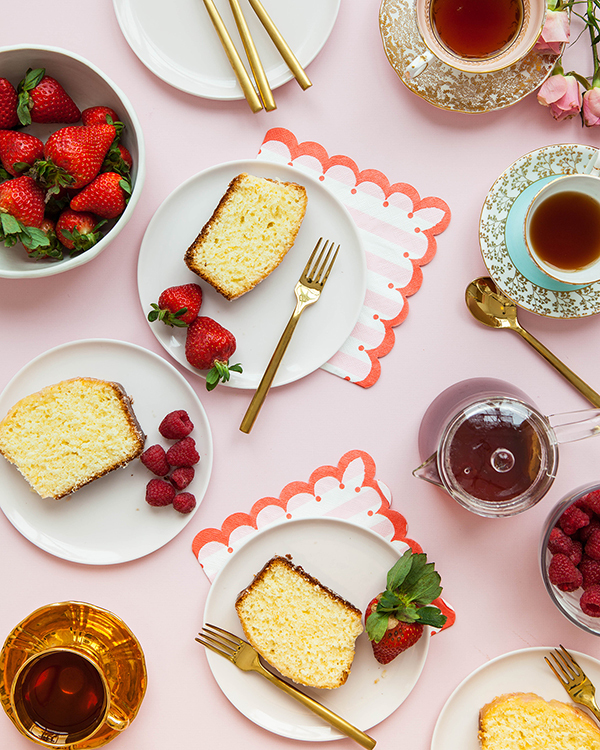 We’ve been hosting a lot of tea parties in the studio lately. 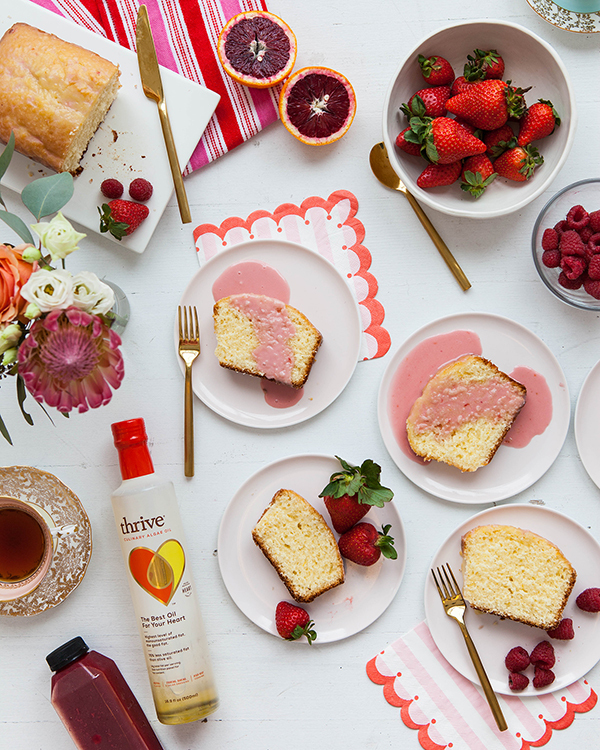 We partnered with Thrive Culinary Algae Oil to develop this pound cake recipe that is perfect for a tea party. Thrive oil is much healthier than regular cooking oil because it’s made from algae. It has 75% less saturated fat than olive oil and a light flavor. It’s like a magic oil! You can cook with it and it tastes great. 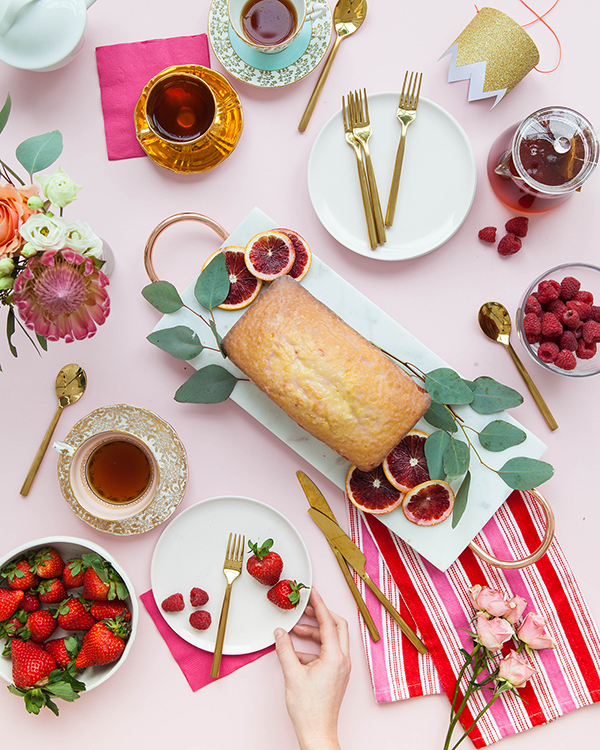 We hosted a little Valentines Tea Party and made this Blood Orange Glazed Pound Cake with it. 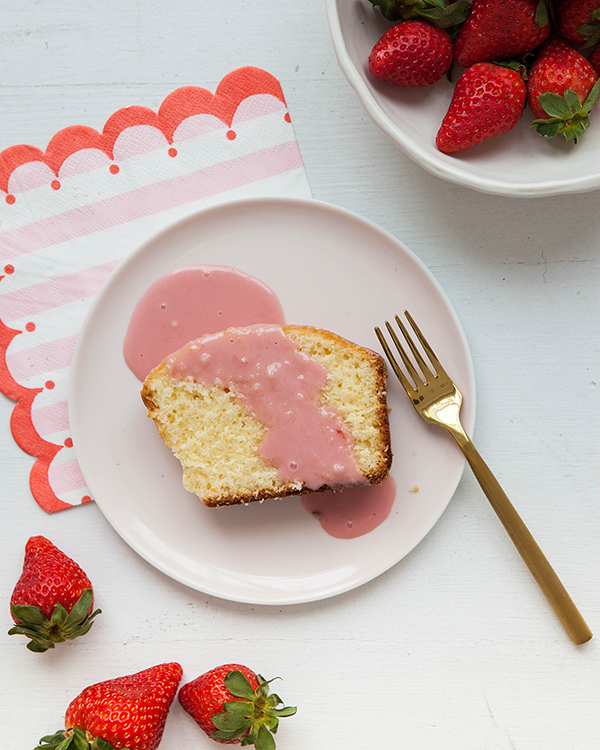 One thing that we love about this cake is the glaze is pink! 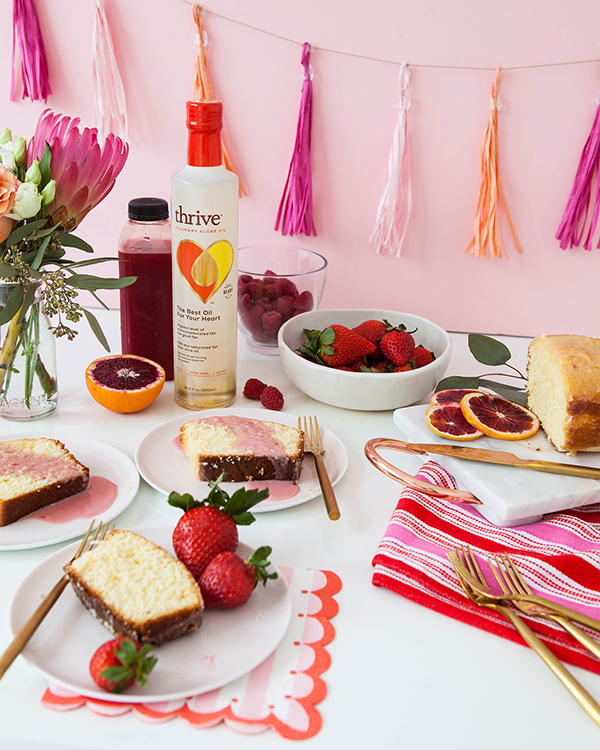 Pair that with some bright berries and blood oranges and it is the perfect color palette for a Valentine’s day brunch. We never say no to cake for breakfast! This post is sponsored by Thrive: Culinary Algae Oil. Thrive Algae Oil, made from algae, is a healthier alternative to traditional cooking oils, with a super high level of monounsaturated fats (the good ones!) and 75% less saturated fat than olive oil. Thrive brand believes in nourishing people today and for generations to come, with the earth’s resources in mind. Thrive is one of the most sustainably produced culinary oils. I don’t know what looks better. 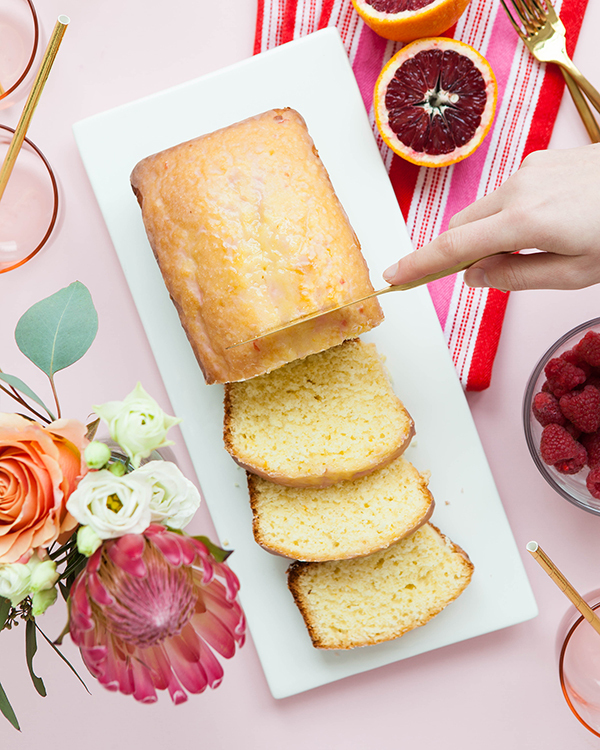 This pound cake recipe or your photography. Either way I’m jealous. Wow, this is unlike any cake I’ve ever eaten – I’ve only ever had sour cream with chips or wedges – but that makes me so intrigued to try it! Gorgeous photos as well; everything is displayed so well, and it makes the cake look even more enticing. Yummy, I bet it tastes amazing with that glaze! Ahh this looks amazing! I’ve never made anything with blood orange before but it looks tasty! Very good idea. My daughter has a birthday on Saturday. I think I’ll surprise her. I was looking for something special to make this weekend and I think I’ve found it, this looks amazing. Looks lovely! I love red orange! Mostly we use it for some drinks like cocktails or juice. Now I have to try this recipe. It seems really good. Thank you for sharing it and keep up.